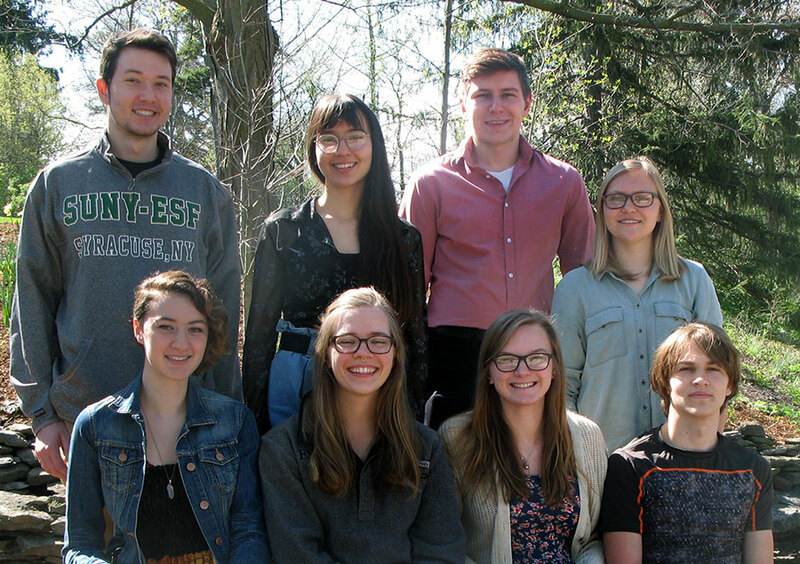 Nineteen students at the College of Environmental Science and Forestry (ESF) were named Career Fellows for 2018, which will support their studies of subjects ranging from wolverines in Mongolia to ecosystem health in Ghana and post-hurricane rebuilding in Puerto Rico. Career Fellowships support internships, interdisciplinary projects and conference attendance for undergraduate and graduate students. ESF Career Fellows are exceptional students who seek to pursue experiences that shape their academic and professional development. These fellowships are made possible through donations to the ESF College Foundation, specifically The Fink Family Foundation (Betsy '79 and Jesse '79), ESF Alumni Association in memory of Robert M. Sand '50, Douglas and Susan Cotton, and Richard J. Ahearn '74. Alicia Bateman, a sophomore environmental resources engineering major from Lederach, Pennsylvania, will complete research on the relationship between Ghana's Korle Lagoon and the surrounding urban settlements, culminating in a proposal for ecological engineering solutions to mitigate flood risks of the area and improve ecosystem health in Accra, Ghana. Nicholas Bentley, a sophomore biotechnology major from Camillus, New York, will study therapeutic horticulture, the use of plant and plant-related activities to promote mental well-being and a state of restfulness, and to accelerate healing and recovery, at several Syracuse sites with active programs. He will complete assessment and research on therapeutic horticulture in regard to patient involvement and engagement, and cost-benefit analysis of specific activities. Timothy Bova, a sophomore conservation biology major from Arlington, Virginia, will research frogs of the Pelophylax genus by assisting with field capture, data collection and lab work alongside faculty and graduate students at Nanjing Forestry University in China. He will also assist with on-going projects and herpetofauna including viper niche partitioning and radio tracking endemic vipers/elapids. Mikayla Call, a senior environmental biology major from Catonsville, Maryland, will conduct wildlife research in the Darhad Valley region of Mongolia, focusing on local flora, fauna and ecosystem processes. She will assist with research regarding the Mongolian Wolverine Project, dedicated to documenting the wolverine (Gulo gulo) for the first time in Mongolia. Reilly Carlson, a senior conservation biology from Williamson, New York, will work with the Northwoods Wildlife Center in Minocqua, Wisconsin, on wildlife rehabilitation including basic medical procedures, transports and releases, and care of non-releasable animals. She will educate center visitors through an ecology program and site tours. Rebecca Cosgrove, a junior environmental studies major from Dunkirk, New York, will intern with Baltimore Woods Nature Center in Marcellus, New York, helping environmental educators deliver lessons in the Syracuse City School District and field trips to the nature center. She will also work on program development, review and assessment of educational programs, and grant-writing. Xue Dong, a graduate student in environmental interpretation from the People's Republic of China, received funding to attend the International Conference on Interpretation where she will present on "Interpreting China's Dujiangyan Irrigation," a specific interpretative planning project for a World Heritage Site in China. Harris Eisenhardt, a senior sustainable energy management major from Chatham, New Jersey, will work with a team of interns to develop a prototype sustainability impact report focusing on the construction and planning of a new museum to be erected in Easton, Pennsylvania. He will analyze key information regarding community health, energy and economic impacts from the project, and will present results to stakeholders. Noah Garwood, a junior wildlife science major from Princeton, New Jersey, will attend the International Herpetological Symposium where he will present a travelogue detailing his time in the Peruvian Amazon. Aimee Hudon, a graduate student studying mycology and forest pathology from Russell, Massachusetts, received funding to present her research at the International Mycological Congress. She investigated fungal communities growing on scrub oak roots in a fire-regulated ecosystem, which serve as important tools for restoration. Billie Li, a senior environmental resources engineering major from White Plains, New York, will complete an internship with Big Island Farm in Hawaii. During her internship, she will learn farming and develop an independent project focused on tropical horticulture, permaculture, community land restoration and indigenous farming practices of Hawaii. Michael Mahoney, a junior forest ecosystems science major from Bedford, Massachusetts, received funding to assist with start-up costs for a summer research internship with the New York State Department of Environmental Conservation. He will explore the impacts beavers have on forest structure and composition in New York state as they begin creating management challenges. Taylor Mallaber, a junior sustainability energy management major from Livonia, New York, will focus on helping rebuild communities in Puerto Rico and repairing recent hurricane devastation, expanding her skills in construction and working in unstable communities with the non-profit organization All Hands and Hearts. Laine McCall, a graduate student from St. Louis, Missouri, who is studying conservation biology, will complete a policy internship with Natural Resources Solutions, an organization that tackles modern conservation problems, specifically performing qualitative research used to gain an increased understanding of stakeholder resistance to the Endangered Species Act. Joanne Pereira-Melo of Flushing, New York, and Olivia Pinner of Syracuse, New York, junior landscape architecture majors, will participate in workshops and design charrettes in Vitoria-Gasteiz, Spain. They will engage in discourse involving urban green systems and green infrastructure. They will also complete an independent field study of a park system analysis of Vitoria-Gasteiz, Madrid and Bilbao to gain a stronger understanding of how urban parks play a role in connecting culture and ecology. Cameron Piper, a conservation biology major from Yonkers, New York, will further her skills in field research, study design, project management and monitoring techniques through an immersive conservation experience in northern Mongolia with a specific focus in under-studied landscapes and wildlife. Alexandra Sholk, a conservation biology major from Lockport, New York, will assist faculty from Federal University of Amapa in Brazil in researching yellow-spotted river turtles, specifically collecting and analyzing data on nesting sites. The data collected will be used to determine the locations of hydroelectric dams to be constructed in that region. Kiley Voss, a conservation biology major from East Aurora, New York, will travel to Costa Rica to complete research that directly affects stakeholders in their communities as it relates to their natural and human resources, with a goal of addressing relevant and real environmental problems such as the growth of ecotourism and increasing practice of agriculture. Alexander Young, a forest and natural resources management major from Baltimore, Maryland, received funding to present his research regarding tardigrade (commonly known as water bears: water-dwelling, eight-legged, segmented micro-animals) community response to nitrogen and phosphorous addition at the International Symposium on Tardigrada.